This post may contain affiliate links. The small commission we make from affiliate purchases helps keep me in coffee and books but doesn't make a difference in what you pay. All opinions are my own and I only suggest books I truly love. Please see our full disclosure for additional information. I love books. They bring magic and wonder to the minds of so many. We've talked about this before. What we haven't talked about is my obsession with parties. I love planning a themed party. I love the look on the faces of kids when they walk into the pages of a book or their favorite cartoon. For my son's 13th Birthday I threw the biggest party I could put together for him. No budget and nothing was off limits if I could make, borrow or rent it! See we adopted our son from foster care. He moved in with us when he had just turned 12 years old. He had never had a "real" birthday party. When he moved in with us his birthday had just passed and asked him what was something he always wanted and didn't have. He said, A baseball glove my husband scooped him up and they were out the door on the way to the store before I could stop crying! I was so darn mad at his parents. 12 years old and all that boy wanted was a baseball glove. I'd be lying if I didn't tell you that all these years later I wasn't still sitting here tearing up just typing this paragraph. He and my husband spent many nights in our front yard throwing a baseball back and forth. There was a dent or two in my old Camry to prove they both occasionally missed. I didn't really care....those dents came with a certain amount of love attached to them. They came from hours of bonding and happiness between my son and his dad. I was okay with those dents. He was playing on a little league team for the first time ever and having a great time. He was behind the other kids in skill because he had never played "real" baseball before but he was determined and it carried him a long way. In January I received some documents in the mail from DSS and I hated it. I hated getting mail from them because I knew at any time they could take him and give him back to his family. I knew that we had a certain amount of time left with him where he was safe in our home and it included his birthday. I talked to my husband that night and we agreed. If he was only in our home for one birthday and if it could possibly be the only one he might ever have we were going to give him the biggest and best birthday party ever. I immediately started to plan. So here we are 5 years later and he carries our last name and our hearts with him everywhere he goes. Every day of our lives my husband and I try and make up for the first 12 years of his life by filling it with love, laughter, and great memories to replace the bad ones. So it only seemed fitting that I dedicate the first post in this new series to my boy. 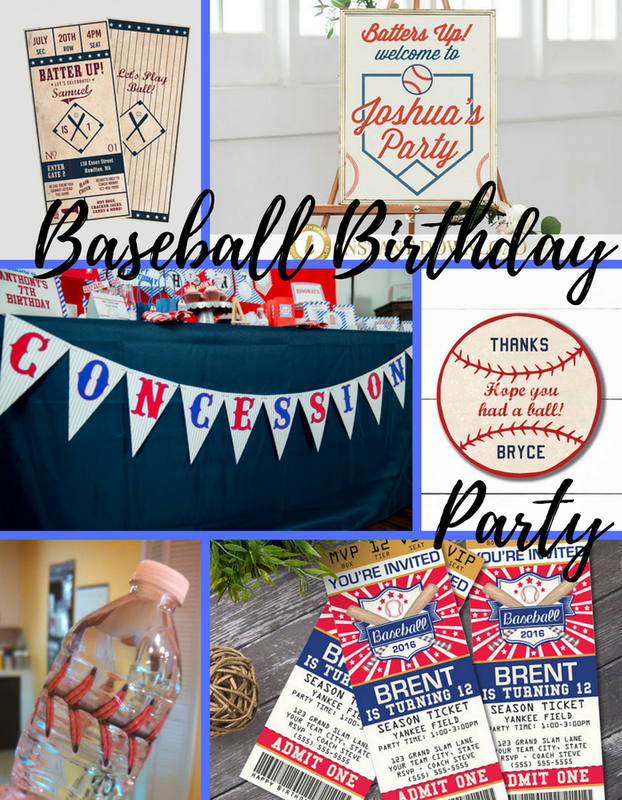 So let's plan a Baseball Party! Call your local rental company. Whether it is just a standard rental company or a wedding rental company they are going to have exactly what you need to feed a crowd. The Hotdog Machine held 75 Hot Dogs per side. Meaning I could cook 150 hot dogs and have plenty for our guests without having to wait for the grill space. If you're having a smaller party cooking your hot dogs in a crock pot works great. Check out the tutorial from Stockpiling Moms. We used the machine because we had a lot of people and the rolling machine made for a neat visual. It really added to the concession stand feel. I laid out a hot dog and nacho party bar full of toppings. We melted nacho cheese in a crockpot and bought nacho chips from Sam's Club. I made a concession stand sign and hung it on the bar and spread out all the toppings for both the hot dogs and nachos. For months before the party, I saved coffee creamer bottles and reused them as topping dispensers. While at Sam's Club I went ahead and grabbed my favors. It only seemed right we had peanuts and cracker jacks. Sam's club carries the small personal sizes and they were perfect for little hands to grab on the way out. When I was thinking about food and favor options I just tried to think back to being little and being at the concession stand for my older brother's baseball games. It was full of licorice strings, Swedish fish, bubble gum baseballs, Big League Chew, Fireballs and so much more. So when I went into the candy aisle that's what I was looking for. I also picked up some of my paper supplies while I was there. Check with your rental company. If your hosting a small party and only need a few of each see if they will sell you some. They almost always carry these in inventory. Another option for a small quantity might be Amazon or Etsy but I will tell you for the cost of the items at Sam's club it was going to cost me more to have a small quantity shipped. The Popcorn bags were just over $6 for 500. Yes, we had lots leftovers but we just used them for other things or movie nights at the house and used them at picnics and other parties. The best part of the party bar design is that I set the food up and walked away from it. I didn't have to cook or hover over the food. Everyone helped themselves and I cleaned up after everyone was gone. I skipped the cake and my wonderful mother in law offered to help and made 200 cupcakes for me. Half Chocolate and half vanilla and I shaped them into a baseball and baseball glove on the counter along with sprinkles and other toppings for everyone to create their own favorite. If DIY is your thing but your time is limited try these super cute printables from Etsy. You purchase the design and download it to your computer. You print it out and put it together. It's inexpensive but still has a handmade look to it. This Concession Stand Banner from Printable Studio 505 is perfect. 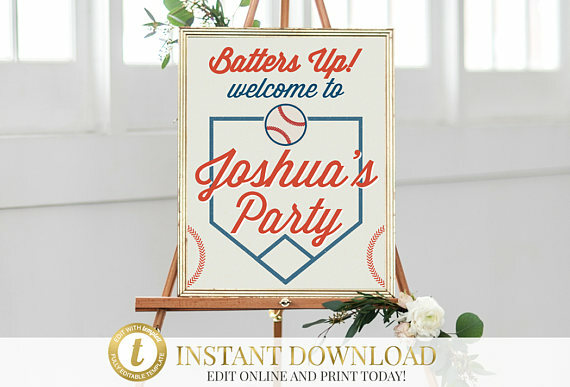 It's a very classic baseball look without being so "Baseball" that it couldn't be reused later for a movie night theme or party. It's a lot of fun to have themed items but the ability to use it again later is a big plus! For his invitation, I made a Baseball Game Ticket. I received a lot of compliments on them. With a quick search, I came up with a few options on Etsy that you can print right at home. If your printer at home isn't the best then Staples is a great option. You can email these directly to them or pop them onto a USB and they will print them out for you. The colors are bright and I print things with them often. With a USB you can also use their self-service copiers which are cheaper. If I had it to do over I would still have bought the peanuts and cracker jacks as favors but I would have also popped over to the Dollar Tree and buy Wiffle Ball Bats. They are inexpensive and something they can take home and enjoy. If your local Dollar Tree doesn't have them on hand you can order them by the case or as individuals on their website. I also purchased a Baseball Base kit from the Dollar Tree and the kids and adults went outside and played a fun game of baseball. The kit included rubber bases which we used for at least a year or two afterward. Best Dollar ever spent! Where was I going with that? Favor Tags of course! and I LOVE this Welcome Sign by Pretty Little Invite. I used a simple white tablecloth over round tables. I used baseball seam tape and made stripes on the table to give it the look of a large baseball. 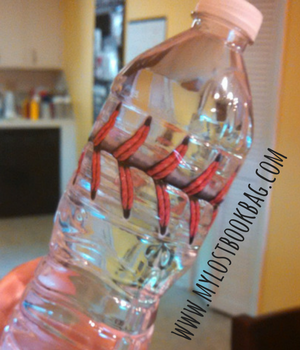 I also pulled labels off water bottles and replaced it with the seam tape to give the bottle the look of a baseball. I loved the look. For centerpieces, I used green paper shreds and a basket filled with peanuts for each table. I wanted simple. I actually bought my baskets this time of year and purchased baseball themed Easter Baskets on sale. They were perfect for outside. If you were inside you may want to consider another option versus having peanut shells all over your floor. There are tons of creative ideas on Pinterest and you're bound to find an option that fits your needs. As I mentioned above we had a fun baseball game to entertain the kids. We also had an inflatable water slide on hand which the kids enjoyed. Having a June birthday it was warm outside so we also set up a slip and slide for a little afternoon sliding practice. We knew not everyone could be on the water slide at once so having multiple stations helped split everyone up but still give them plenty of water fun options. We also had a batting station with buckets of water balloons for batting practice. Make sure your invitation clearly states to bring towels and a change of clothing if you're going to have water games. We had a great day they day came and went and I have very few pictures to remember it by but we have a lifetime of memories. I hope this will help you in making a special day for your little slugger. Questions? Comments? What did I forget? We'd love to hear from you! Apr 4 For the Love of all things Unicorn!